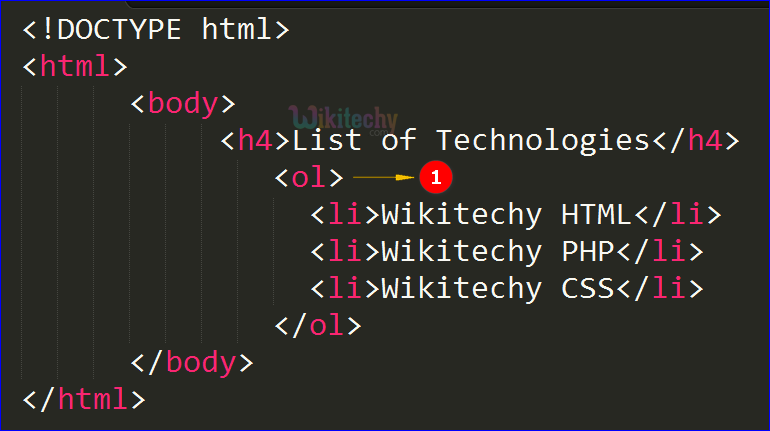 <ol>tag is defined as the ordered list. <ol> tag is displayed with numerical and alphabetical. By using <li>tag it defines the list. The “start”and “type” attributes are deprecated. It supports “start”and “type” attributes. It doesn’t support “compact” attribute. The “reversed” attribute is new in HTML5. .<ol>tag used to list the content in order. The content is displayed in ordered list with numerical form. i Yes Yes Used to define which kind of bullet point will be used.